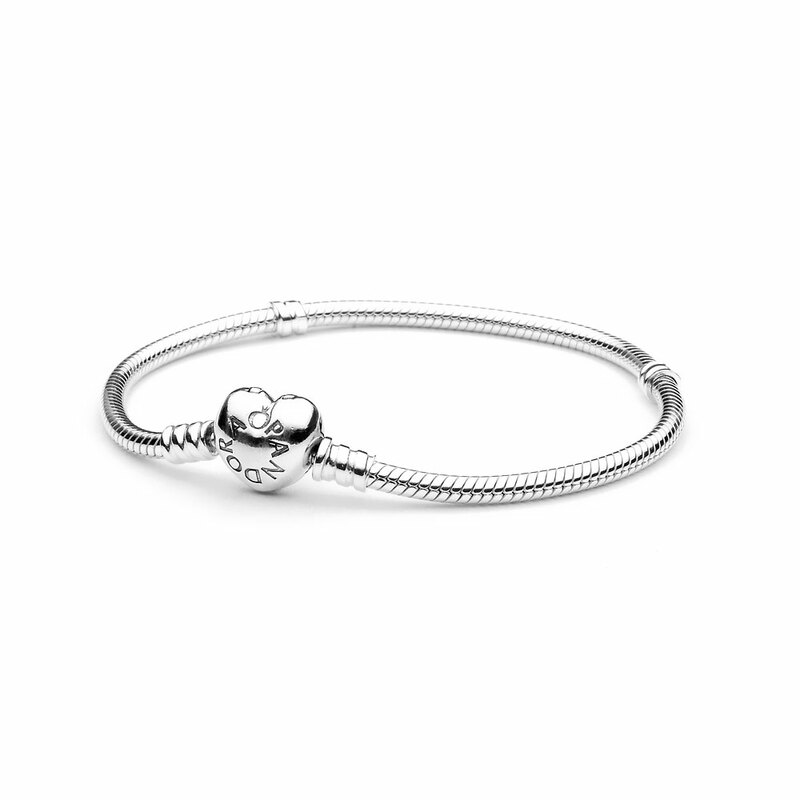 Silver bracelet with heart-shaped clasp - PANDORA is rated 4.6 out of 5 by 244. Rated 1 out of 5 by TroyOH from Poor clasp Bought for my wife and it fell off twice on xmas day. It opens way to easily. Looks nice but pretty useless. Might try the barrel clasp and see if it holds up better. Rated 5 out of 5 by Catgran from Perfect after wedding Present! I bought this for my daughter, who recently married her high-school boyfriend after 8 years. When they were dating, he gave her a Pandora bracelet, & all 4 of we parents bought charms for it. I bought this beautiful bracelet, & add a few charms; the wedding theme was Hearts, so the bracelet was perfect! Adding the Daisy safety-chain because they had a outside rural wedding, in a field with dandelions, violets, daisies, with the autumn leaves turning gold & red. So I added the autumn leave charm; more charms they can add themselves over the months, years, decades. Rated 5 out of 5 by jctn from So beautiful My daughter purchased this for me a couple of weeks ago, just for an I love you mom thingie that she does. I love, love, love it. I sure get a lot of compliments on it. So happy to have and I enjoy wearing it so much. Thank you Lindsey. Rated 5 out of 5 by Beast from I love the heart I hope this bracelet clasp is stronger than the lobster claw one. That clasp broke which is why I bought this one. Can I get that bracelet repaired? Please let me know. Thanks! Rated 5 out of 5 by sammiecat from Beautiful!!! My wife and I bought this charm bracelet for our daughters 38th birthday and added charms. She loves it! Purchased it directly from Pandora to make sure it was authentic. Rated 5 out of 5 by isabella_louise from Timeless I got this about a little over a week ago and I am enjoying it. It’s my first Pandora purchase. I’m not having any trouble with the clasp so far. It’s easy to pop open and snap close and I have no issues with it opening on its own. Can’t wait to add more charms. Rated 4 out of 5 by greenbean2 from Great features My mom bought me the bracelet for my birthday and i loved it. It was frustrating to open and close the clasp but overall i love the bracelet!